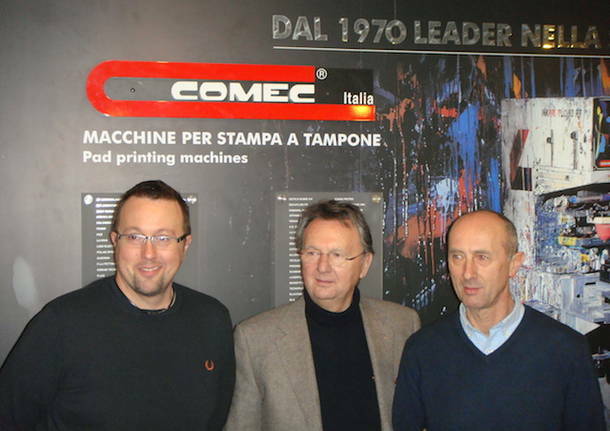 The history of Comec Italia goes through the last five decades, leaving a clear and definite sign: the pad printing, which in these years has become the means for personalizing infinite objects (or parts) of our daily lives. After a beginning in which we evaluate the market always starting from the industrial sector and printing, it lands at the extraordinary technique of pad printing: Comec in fact brings the pad printing in Italy and more than 45 years has been to expand the market and develop this technology in the best way. Was founded CO.ME.C (Costruzioni Meccaniche Cavaria), a society that deals with the construction of industrial machinery in general. In the moment when the textile crisis also affects Italy, Comec converts its production, which at that time was mainly presses for hot printing on T-shirts, in another type of printing: pad printing. So Comec brings pad printing in Italy. Born Polyprint snc, a company founded for the supply of consumables for pad printing: inks, pads, clichés, and printing for third parties, to support the production of machines. The company moved in Cavaria Artisan Center, in which foundation actively participates the management. This is also the year of introduction of the technology of hermetic inkcups: until now in fact the pad printing is carried out with the use of open inkcups. This innovation will be decisive for the development of pad printing as we know it today. The two companies merge into one company: born Comec Italia srl; in recent years the company will also start to see abroad its main market, another move that will prove successful, developing a multilingual sales office. The company expanded by acquiring an adjacent shed and so divides the spaces more rationally: the mechanical workshop and the business office as well have its own proper place. In recent years Comec Italia has focused on technological innovation, with the introduction of electronics in the design and construction of their pad printing machines: from brushless motors to the robot functions to touch screen controls and vision systems. In addition, its presence in the various countries of the world is always expanding, hand in hand with the market. Comec Italia has acquired a 500 square meter warehouse adjacent to its current headquarters in the Artisan Center of Cavaria. The expansion comes from the point of view of a reorganization of spaces, commensurate with the development of the market that the company is experiencing. The new building will host a new and larger silicone pad (for the machines) creation department and an internal printing department for sampling, printing tests and small batches.